…you know…they’re going to get flashed” – paraphrasing Dave Graham in Dosage 4. 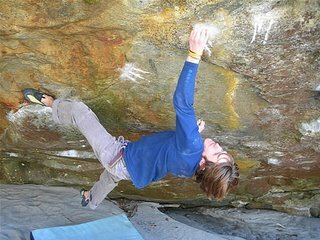 Speaking of standard setting problems getting flashed, Freakclimbing has a good story about the recent flash of “Ganymede Takeover” (V13) at Brione, Switzerland by James Pearson. V13 has been flashed previously by the likes of Sharma & Litz but those problems were subsequently downgraded. “Ganymede” was initially graded V14 by Dave Graham but has settled in the V13 range. Story also recounts James’s trip to Swizzy with Ben Moon and others.